Here's another breaking news. The Philippine stock market sets a new record close above 7,700 mark. I am really excited. How about you? Get inside so you'll know where I'm coming from. Some years ago, I used to read news papers or surf in the internet about what is happening on the local show businesses or local or international sports. Time really changed. Now surfing the business section of the local news website is now part of my morning routine. What happened? Well, just wanna share that this habit I might say, for the lack of appropriate word at the moment was developed with the influence of brother Bo Sanchez' Truly Rich Club. For me it's part of the positive mindset transformation that was brought to me by listening to PowerTalks, reading Stock Market Update, reading insight from The WealthStrategies newsletter and participating to like-minded individual inside the social networking website. You read it right, TRC has it's own web platform similar to Facebook wherein, every member can ask each other or help one another about how to do certain business, how-tos related to the Philippines Stock Market, and other kumustahan personal stuff. Ok, that's for today. If you happened to visit this blog, via Google, Yahoo or links from other social networking or social media, or if you're one of this blog's subscribers, THANK YOU for coming and reading my stuff. I want to take a chance to invite you to be a member of brother Bo Sanchez' Truly Rich Club. 100% guarantee, the best kind of learning investment that you can have this year. 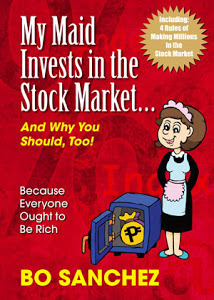 "The Philippine stock index climbed to a fresh all-time high above the 7,700-mark on Wednesday. At the Philippine Stock Exchange, the benchmark index jumped 102.91 points or 1.35 percent from 7,630.71 yesterday to close at a new high of 7,716.06, eclipsing the January 30 record close of 7,689.91 for its eight this year. The PSEi also marked a new intraday high at 7,738.12, surpassing the previous record of 7,736.97 on January 29. 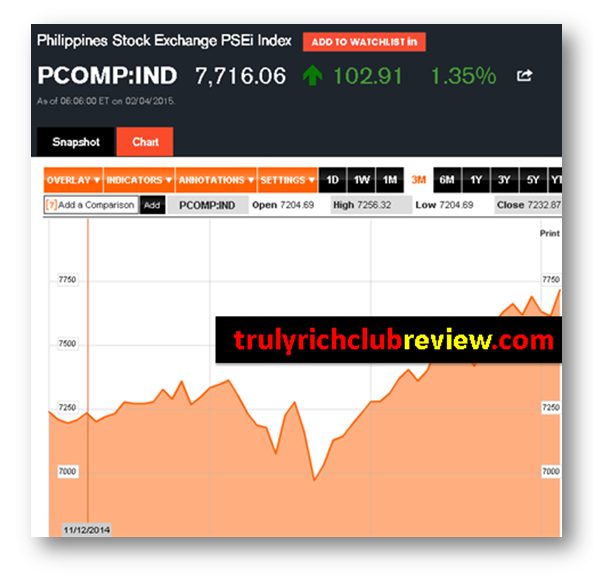 “While the PSEi trekked higher mostly in-step with Wall Street and other Asian markets, the Philippine story remains attractive to investors. The positive expectations continue to support the market’s uptrend,” said PSE president Hans B. Sicat. All counters were in the green, led by the services, which rose by 1.97 percent, followed by mining and oil at 1.66 percent, and financials at 0.96 percent. Advancers beat decliners, 109 to 63, while 48 issues were unchanged. Value turnover reached P7.19 billion, as 1.99 billion shares changed hands. The most actively traded stocks were PLDT, Universal Robina, Megaworld, Ayala Land and Security Bank." The savings scenario in the Philippines and the healthy inflow of foreign funds will continue to drive the stock market through its bull run this year and the next. The PSEi is seen ending 2015 at the 7,900 level and trek higher to 8,780 by end-2016, an official of the Philippine American Life and General Insurance Company (Philam Life) said Wednesday. Foreign investors will continue to buy Philippine stocks as the country's growth story continues to be positive, Philam Life head of Equity Fund Management Eduardo Banaag told reporters in a briefing in Makati City. "Fund managers, like us, they favor the Philippines along with Indonesia, China, New Zealand and India," he said. "Economic growth is divergent, as well as monetary policy. But here, growth has been accelerating," he noted. In fact, foreign funds bought $530 million worth of Philippine stocks just in January, versus $1.27 billion in 2014.